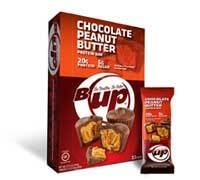 B-UP bars are low sodium and gluten free. We go where no bar has gone before, blending the highest quality nutrients with select mouth-watering ingredients to deliver advanced nutrition that simply tastes better. INGREDIENTS: Prebiotic Dietary Vegetable Fiber, Peanut, Milk Protein Isolate, Whey Protein Isolate, Chocolate Cookie (Calcium Caseinate, Chicory Root Fiber, Palm Oil, Sugar, Alkalized Cocoa Powder, Ground Flax Seed, Sunflower Lecithin And Natural Flavor), Organic Chocolate Coating (Unsweetened Chocolate, Cane Sugar, Cocoa Butter), Peanut Flour, Glycerin, Natural Flavors, Xylitol, Chocolate Chunks (Unsweetened Chocolate, Cocoa Butter, Soy Lecithin [emulsifier], Vanilla), Sunflower Lecithin, Sea Salt, Almond, Cashew, Sunflower Butter, Stevia. ALLERGENS: Contains Milk, Tree Nuts (Almond & Cashew), Soy, and Peanuts. Manufactured on equipment that processes peanuts, soy, and other tree nuts.